a cat in a window. you know, like a live kitty-cat? but not in house windows, in store front windows. it really makes me curious. does the cat live there? does it come every morning with the owner? how does it get there? cat carrier? does it have its own food bowl? litter? there are just so many questions. and i don't even like cats. but it still makes me smile. even though i would be doomed with allergies 2 seconds after entering the shop. maybe it's because a good book always has an amazing bookstore. and there is always a cat who lives there. a creek that sparkles. maybe it has something to do with fall. i feel like the water looks sparkly when the air is cool. the sun shines just right, the rocks create just the right current, and when you look over the bridge, you have to squint because the water is full of glitter. 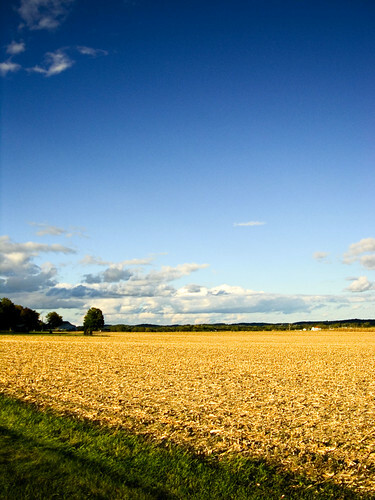 a freshly harvested field. it is so clean. so methodical. so complete. the epitome of a project planned out, planted out, and completed. a tuperware of leftovers. (doesn't really flow with the other ideas, but hey, i'm just saying...) i think the majority of people hate leftovers. probably because as kids it was a way worse option than a pb&j sandwich. plus it was usually meatloaf. (beatloaf, i hate meatloaf). but to me, leftovers taste deliciously of connivence + simplicity. i love emptying a pan into portioned out containers. lunch is ready! and on a side note, i am picky about my leftovers. i don't like the taste of reheated food...so i don't usually reheat them! i'll go cold, or slightly room temp. odd. i know. This is your best blog yet! 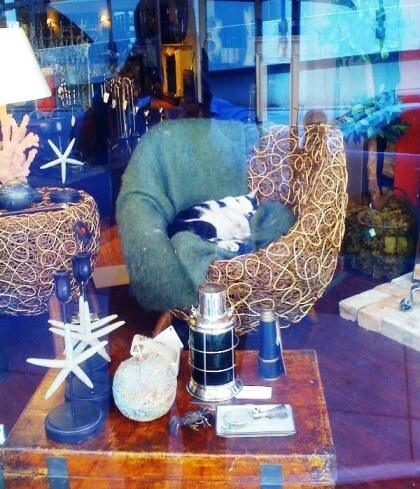 That is strange to see that cat in the window...what shop is it? Did you know that Savannah has a problem with wild cats? I'm not kidding...there are stray cats everywhere...its kind of sad. I hate cats too. kind of. This blog post just brought all sorts of joy to my heart. i love the cat in the window! it's like a fairy tale! "once upon a time there was a little cat. he lived in a bookstore..."
&& i eat all my leftovers cold too. unless it's a soup or gravy--i can't stomach the layer of gelationous goop that forms. must reheat. other than that-- i'm a "right-out-of-the-fridge" kind-of girl! yay! i can comment again. i LOVE that corn field picture!